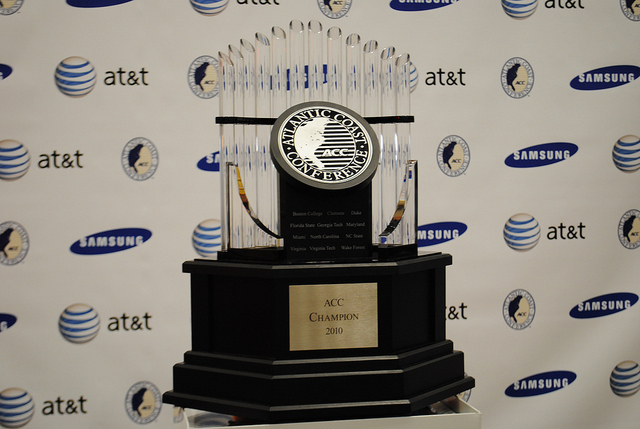 The ACC and the ACC Digital Network have announced the 2013 ACC Trophy Tour beginning tonight in Chapel Hill. In celebration of the 60th annual of the men's tournament, the ACC will take the Official Championship Trophy on tour with stops at various ACC men's basketball gameswitt he final stop being the 2013 ACC Men's Basketball Tournament in Greensboro, N.C. March 14-17, 2013. As part of the Trophy Tour, fans at the games will receive a "Watch and Win" scratch card to have the chance to win an official commemorative ACC Championship basketball. The lucky number will be revealed following the game and announced within the ACC Digital Network's game highlight video. Fans everywhere can enter to win the Grand Prize, a pair of ticket books to the ACC Men's Basketball Tournament by visiting theACC.com/trophytour to enter. Tuesday, February 5th Wake Forest at North Carolina 7:00 p.m.
Tuesday, February 12th Virginia Tech at Virginia 7:00 p.m.
Saturday, February 23rd Miami at Wake Forest 1:00 p.m.
Sunday, February 24th Boston College at Duke 2:00 p.m.
Tuesday, February 26th Wake Forest at Florida State 9:00 p.m.
Wednesday, February 27th Maryland at Georgia Tech 8:00 p.m.
Thursday, February 28th North Carolina at Clemson 7:00 p.m.
Saturday, March 2nd Clemson at Virginia Tech 8:00 p.m.
Wednesday, March 6th Wake Forest at NC State 9:00 p.m.